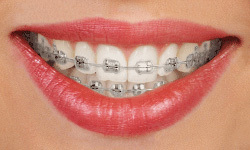 Traditional metal braces, the most common type of braces, are more comfortable today than ever before. Comprised of high-grade stainless steel, metal braces gradually straighten your teeth through metal brackets and archwires. Metal braces also allow for a more unique and colorful smile during treatment by adding colored elastics around the brackets. For older teenagers and adult patients who have cosmetic concerns, ceramic bracers made of clear materials are less visible than traditional metal braces as they seemingly blend in with the color of one”s teeth. While they are visually less prominent, they do require more attention to oral hygiene, as ceramic braces are larger and are more brittle than their metal counterparts. Clear aligners, an alternative to braces, are a series of invisible, removable, and comfortable acrylic trays that straighten your teeth. Made of a plastic material, clear aligners ought to be worn twenty hours a day for maximum efficacy. Not only are the aligners inconspicuous, they are also removable; therefore they do not interfere with normal dietary habits. Additionally, brushing and flossing are less difficult in comparison to patients who undergo treatment with braces. Furthermore, unlike braces, clear aligners are more comfortable and therefore less likely to irritate the mouth and gums. At our dentistry, we offer clear aligners from Invisalign in Brooklyn, NY. Lingual braces are hidden behind the teeth and are therefore “invisible” when you smile. Lingual braces are fully customized to match the unique shape of your teeth. Lingual braces are a very reasonable option for athletes, models, actors/actresses, musicians who play wind instruments, and adult professionals.